In December 2004, we began the process of converting a retired school bus into a fully self-contained RV. This is the story! 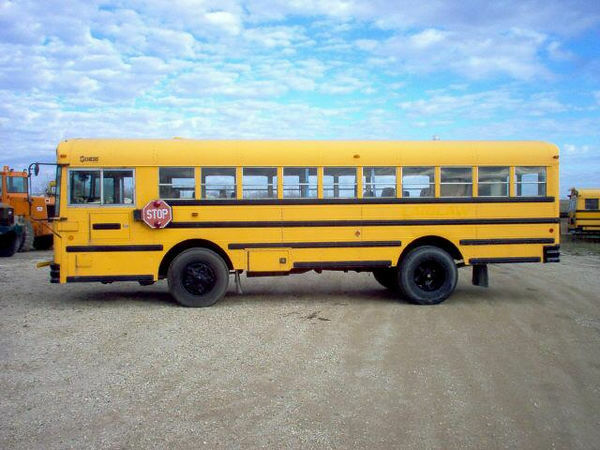 Once I made up my mind to convert a school bus to a homestead, I scoured dealers' websites, harassed the local school district administrators, started hanging out at school bus conversion forums (see links section), and watching buses available on ebay. I found this bus for sale on ebay. The DT360 is (was, actually) one of International Harvester's premium "wet-sleeve" engines. This means that the pistons, rings, cylinders, and con rods can be replaced without having to remove the engine from the vehicle. I drove this bus from Elkhorn, Wisconsin to Flagstaff, Arizona in December of 2004 -- 1700 miles in about 3 days, at about 54 MPH.